Over 400 people turned out for a screening of Un Poquito de Tanta Verdad, in Portland, Oregon, at the beautiful Hollywood Theatre! 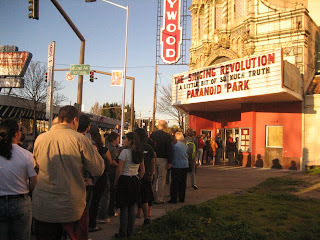 The screening was co-sponsored by community radio KBOO 90.7 FM. Thanks to KBOO, PCUN, Rethinking Schools, Bolivarian Media Exchange, Portland Central America Solidarity Committee, MEChA PSU, and everyone else who helped get the word out!